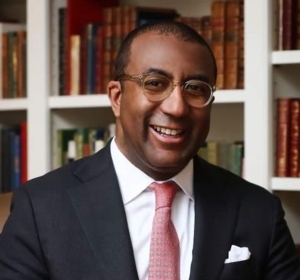 Thu, January 24, 2019 6:00 P.M.
Eric L. Motley, Ph.D., is an executive vice president at the Aspen Institute, responsible for Institutional Advancement and governance. He previously served as Vice President and Executive Director of National Programs and prior to that he served as Vice President and Managing Director of the Henry Crown Fellowship Program. Motley came of age in Madison Park, Alabama, a small community founded by freed slaves in 1880, where constant lessons in self-determination, hope, and unceasing belief in the American dream taught him everything he needed for his journey to the Oval Office as a Special Assistant to President George W. Bush. He recounts the indelible effects this community had on his life and worldview in his memoir, Madison Park: a Place of Hope. The Rosenbach collection includes an 1865 commemorative copy — signed by members of both houses of the United States Congress — of the proposal for Thirteenth Amendment to the Constitution, which abolished slavery. This series of programs will examine the historical circumstances of the amendment’s passage and the complicated legacy of the amendment, from Jim Crow to mass incarceration. In Conversation With The Rosenbach is supported by a grant from the Christian R. & Mary F. Lindback Foundation. Seating is limited; advance registration is strongly recommended.